Halohydrins treated with strong base (such as hydroxide anion) can form epoxides through with intramolecular SN2 reaction. When alkenes treated with a halogen in the presence of water they will be converted into halohydrins which can be converted further into epoxides. 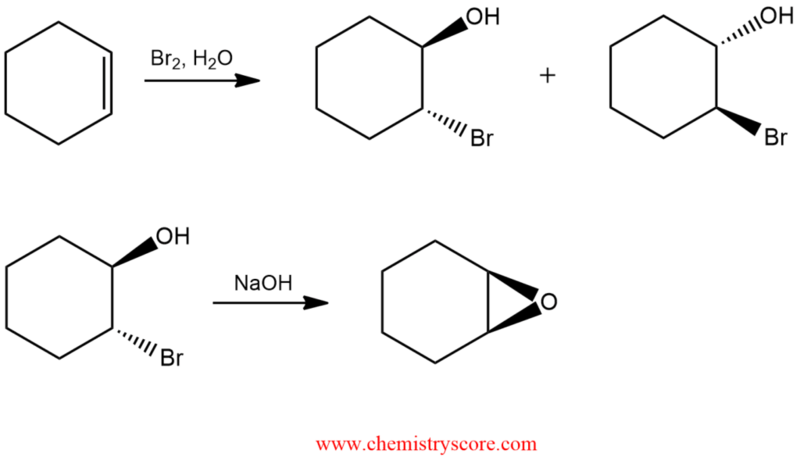 This process achieved via an Williamson ether synthesis. Hydroxide deprotonates the halohydrin and an alkoxide ion is formed. Then this ion acts as a nucleophile in an intramolecular SN2 mechanism ejecting the bromide as a leaving group.